A Ruined Sessions Westminister ! I took my Sessions Westminister to be repaired at a local Clock Shop in Greenwood, Indiana. It had been Re-bushed about 10 or more years ago, but had never ran more than an hour during all of these years. This "Clock Butcherer" told me that he'd have to "Rebush" it again, and my total bill would be $175.00. It didn't run right after he said that he was done with it, as it would run about an hour and then quit running. Then, the winding stem on the left hand side broke, and I had to take it back to him again. He originally offered a year warranty on all clocks that he "repaired". This time, I got my precious Sessions back with a hole drilled larger on the #8 as you'll see in the picture, and the replacement stem is too short to come out to the face of the clock like the one on the right does. I considered suing this creep, but didn't know a value of my clock before he butchered it! Now, it needs the winding stem on the Left replaced with one that comes out to the face of the clock, and also now a New Face for it too! If you know a value of my clock before it was butchered, please let me know. If you know where I could get another Face for it, and have the stem replaced too, please let me know. 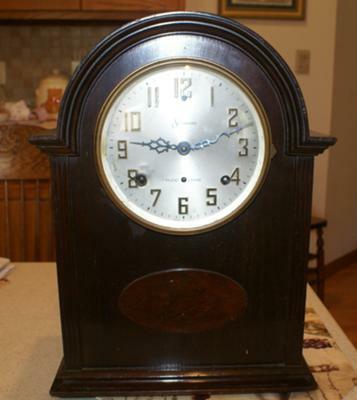 I would also like to know if you know someone reliable to repair my clock in or around the Indianapolis area. Many Thanks! Comments for A Ruined Sessions Westminister ! I learned early on about repairs in general. Always alter the part to fit. Never,Never alter the repairable item to fit the part/parts. the "looking parts" and matching business of repairs could do the job. I have been doing clock work for many years but never had to rebush an entire clock movement. Most of the time there is a couple worn bushings that usually stops the strike or time train.